The Super Solar School is a one week training developed by DGS (German Solar Energy Society) and align with the curriculum of the SAPVIA 5-day Solar PV Installer course. The course is the ideal preparation for the PV GreenCard solar PV assessment. You will learn how to start or or professionalise your solar power business in only one week! 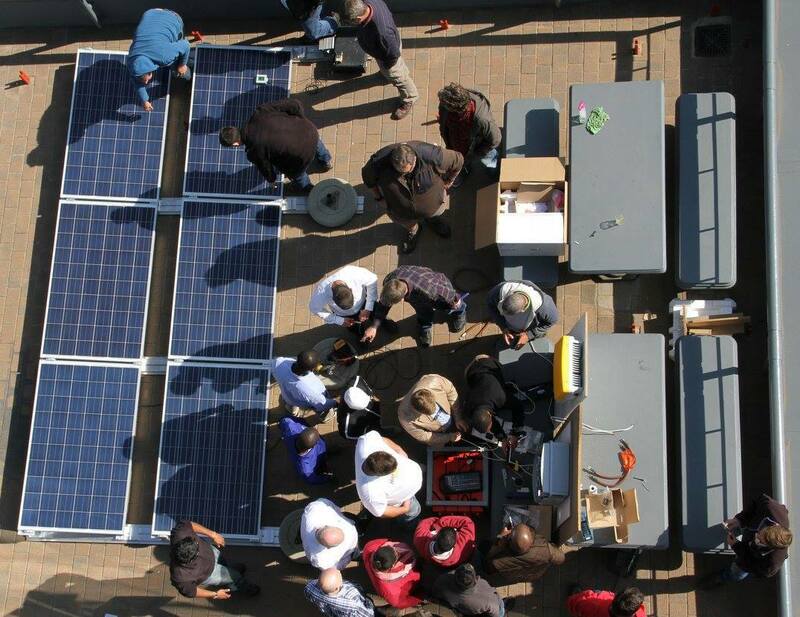 Super Solar School participants are able to design, plan and quote for the installation of state-of the-art PV roof-top back-up systems and to install and operate them. This course prepares candidates to undertake the Solar PV Assessment. Intermediate topics: Electro technical basics (series, parallel connection, current, voltage and their influence on yields, I-V-characteristic curve), PV system concepts (stand-alone, grid-tied, back-up), PV plant components (incl. batteries) and data sheets, site survey and customer consultation, design of a small grid-tied PV plant, economical efficiency, legislative issues and quality assurance (e.g. RAL GZ 966). Designer topics: Planning and design of grid-tied PV systems, calculation of roof-top PV systems with and without simulation programs (6 week software license included), extension of grid-tied systems to back-up systems, fault finding and quality assurance. Technician topics: Site preparation, tools and equipment, basics of grid-tied PV system installation, commissioning and maintenance, joint installation of a training PV system and post installation (routine inspection, data capturing, trouble shooting).